Until recently, my wife and I searched for a house to buy for a long time. It was hard because we live in the San Francisco Bay Area. It’s freaking expensive here. Here’s a nice 2 BR / 1 BA / 752 sq. 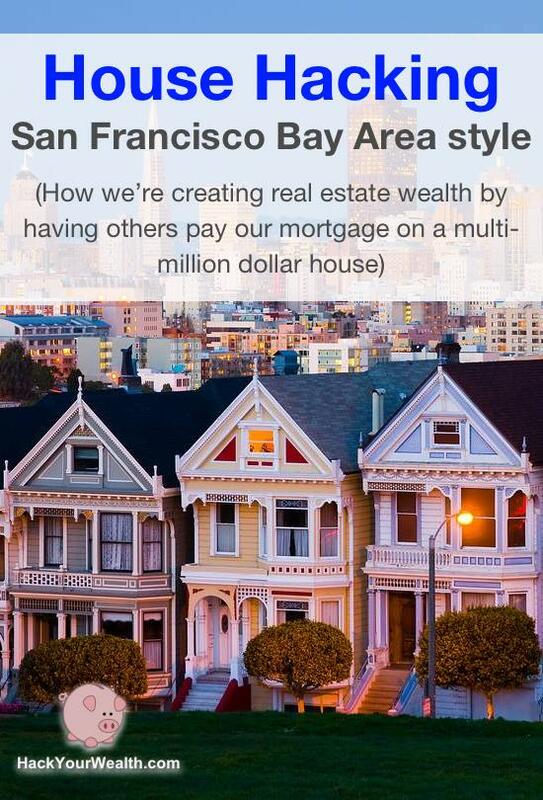 ft. shack in the Bay Area for the bargain price of $2.7 million! Plus, we didn’t want to buy just any ole’ house. We wanted to house hack. House hacking is where you get other people to pay all or most of your housing expenses. House hacking is where you get other people to pay all or most of your housing expenses. Sometimes you’re only able to get other people to pay part of your expenses, reducing your housing costs but not eviscerating them. Sometimes you’re actually able to break even and live rent-free. (If you achieve this, you’re way ahead.) Every once in a while, you can actually get people to pay you more than your housing costs, which means you get paid to live in your own house (holy grail). (1) Buy multi-family. The most common way to house hack is to buy a multi-family building. Live in one unit, rent out the others. Some people get creative with Airbnb (sleep on the couch, rent out bedrooms). You can make significantly more money that way if you’re disciplined, business-minded, and good at logistics. K and I are beyond the age of couch bunking, so we didn’t want to do that. We wanted long-term tenants. But Airbnb is definitely an option (and a good one) if you’re open to it. (2) Maximize your number of “doors.” When it comes to house hacking, as you might expect, the more units, or doors, under one roof, the better, because your own unit becomes a smaller percent of the total carrying cost of the property. (3) But keep in mind that under 5 doors = best loan. Multi-family properties aren’t cheap. And once you get to 5+ units, unless you’re paying cash, the terms of your loan change completely. You go from a residential mortgage loan to a commercial loan. You’re dealing with an entirely different department of the bank. The loan underwriting rules change completely (read: less generous). That’s a good topic for another day (post). (4) Zoning influences the neighborhood. Another thing about 5+ plexes. Since they’re zoned commercial, they tend to be located in somewhat…different neighborhoods than 4-unit or less buildings (which are technically zoned residential). And the types of people who live in commercial apartment buildings are pretty different than the types of people who live in residential buildings. That could be good or bad for you depending on what your criteria are. Drive around and take a look at the difference between the two. You’ll see. Anyway, your best option if you want a normal residential mortgage is to get a 4-unit building. That’s the most you can have and still get a conventional loan. That’s what K and I did. If you think about it, it’s a great deal. You get a commercial-ish property, but it’s like your loan is for a single family house. You get the lowest interest rates because the government wants to encourage you to own a home (or two or eight). You have to pay less money down. The loan process, while not as easy as 1-click Amazon, is generally standardized, well understood, and predictable. In short, as a house hacker / small investor, you get the best bang for buck with a 4-unit building. You can do a triplex or duplex, too, or even a single family home with an in-law unit / guest house, but the economics are simply harder that way. That being said, 4-plexes, because they tend to be the most desirable among house hackers, small investors, etc, are not the easiest to come by…especially in the San Francisco Bay Area. When a 4-unit comes on the market, because of those favorable government loan terms, competition can get ferocious. I mean, like really nasty. 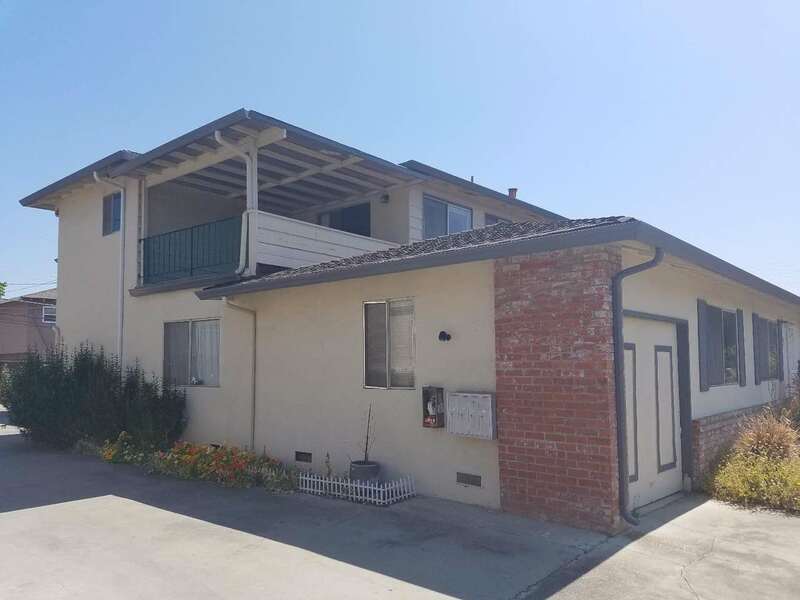 A while back, K and I fell in love with a 4-plex in Palo Alto and we bid on it. It was the most expensive thing for sale I had ever seen with my own eyes. Let’s just say it would have cost most of our lives to pay it off. We gulped, but decided to offer exactly the price they asked. No contingencies. I should tell you we were not even approved for a loan that big. If anything went wrong and we had to back out, we’d lose a six-figure earnest money deposit. I said, six figures in earnest money. We were going to pool together with family to make it work. That can get dicey if there’s a fallout, so I wouldn’t recommend it unless you’re really sure. What else. We wrote the most heartfelt cover letter to tug the seller’s heartstrings. We scripted and shot a lovingly made video. We even offered to have the seller’s agent represent us, too, so he could “double dip” the commission, despite the obvious conflict of interest (he declined). Well, none of it mattered. We got so blown out of the water it wasn’t even close. There was multiple six-figures between us and the winning offer (remember, multiple six-figures over asking!). I even recall at the open house, there were investors puttering around, asking the seller’s agent if they could offer cash right there on the spot to shut down the open house and turn away other buyers. The agent’s phone rang off the hook. I think maybe 10 offers came in total. And the house wasn’t even updated! I don’t think it had ever been updated. Not to mention the termites. I mean, this is seriously how intense the San Francisco Bay Area is. Want a house? Get ready to bleed for it. After that heartbreak, very few units came onto the market. I think we bid on almost every one. We also bid on triplexes and duplexes and even some regular houses. We lost every time. We tried lots of tactics. Bidding MLS listings. Emailing Craigslist landlords to inquire about selling. Attending real estate investor meetups to ask if other property owners wanted to sell. Lurking real estate forums to see what properties were being marketed there (not much, mostly buyers). We drove and walked neighborhoods looking for dilapidated absentee-owner properties. No dice. I also searched tax sale notices and foreclosure notices (almost nothing in my market for either – everyone seems to pay their bills). I tried probate and divorce records for outreach, but the neighborhoods we like didn’t have that info freely accessible. I even seriously considered (and researched) buying email lists to send mailers and blanketing certain target zip codes. Bottom line, for me, in my market, no deals came out of it. Seemed like everyone and their uncle was trying to cash out of high-flying stocks, grab low-interest loans, and then park their money into real estate to weather a potential downturn given all the craziness in Washington. So we gave up. Resigned ourselves to renting. We went apartment hunting at the end of the summer and signed a new lease. We thought about dialing back our Bay Area search and just forgetting about buying here, unless something basically fell in our lap (ha, right). As luck would have it, right after we signed our new apartment lease, but before we started packing up for the move, this guy came onto the market. Location wasn’t an A+, but it definitely wasn’t bad by far. 20 min walk to the train station, which was long-ish but doable (I take the train to work). It was in a secluded area, set away from major streets, but also within a 5 min drive to almost every modern shopping and dining convenience you’d need (tons of variety too). Within a 10 min radius, there was every retailer, grocery chain, big box store, global cuisine, service business, healthcare facility – in short, everything you’d ever need from cradle to grave. Plus, this part of the Bay Area was (and still is) a total feeding frenzy among buyers. The house itself had an attractive variety of units. A 1 bed / 1 bath with tons of closet space which could appeal to bachelors or couples. Two 2 bed / 1 bath, one of which had a private sun deck, which could appeal to couples or small families. One 3 bed / 2 bath, which is basically a single family house, which could appeal to couples or families. This also would allow us to “expand” our occupancy as well: we would live in a 2 bed unit, and then we could later switch into the 3 bed unit if we needed to. The basics looked good, so now it was time for due diligence. If you’re in a crazy competitive market like we are, then the moment you get notice of the listing, your due diligence should begin. There’s not one moment to lose, so don’t sit. If your market is competitive, even shabby houses will move fast, so there won’t be much time. Even if you’re not 100% sure, start the diligence process anyway. Every bit of extra time helps. Only stop after you’re 100% sure you don’t want the place. (1) Understand location and immediate surroundings: less than 1 hour. Focus on this first because location is one of the few things you really cannot change. It’s easier to analyze this if you’re buying locally or you’re already familiar with the neighborhood. But even if not, you can still get tons of info online. First thing we do is plot the address in Google Maps and study the birds-eye view, toggling satellite mode on and off. For us, we wanted to understand where the house was in relation to the train station (noise vs. walking proximity), variety of restaurants nearby, how far it was from noisy streets, access to shopping and services, major roads, etc. We “walk the streets” using street view. We want to see the condition of the house at eye level, its curb appeal, condition of neighboring houses, what their yards look like, what parked cars on the street look like. Google Maps isn’t perfect, but we’re just trying to get a quick overall feel for the immediate area. Would we want to live here? Does it feel safe and comfortable? Does it feel clean? You can get a good sense of these questions just by using Google street view. Location is the most important factor you cannot change. So proximity and convenience to such a wide range of services and amenities was a key selling point for us. (2) Understand the “path of progress” for the area: less than 1 hour – a few days. Equally important is the trajectory of the area. The path of progress. You want to understand where the area is headed economically, demographically, so you can find areas with a strong path of progress and get in front of it. Depending on whether this is the first property you’re diligencing in the area or the 10th, the time you spend on this step may vary greatly. If you’re analyzing your first property, you’ll probably be doing a lot more research upfront: Googling, phone calls, gathering statistics and analysis, walking/driving local streets, even trips to your local zoning department. Who are the major employers in the area? Is industry diversified? What is population growth? Job growth? Is it healthy? How many new units have been constructed in the last couple years? How many construction permits have been issued? Is the area A, B, or C class? Avoid D class neighborhoods, not worth it. What do banks and lenders think about the area? What is the average age of properties in the area? How have rents trended in recent years? How affordable are rents given available jobs? How much pricing power do landlords have? Does the market generally cash flow or is there capital appreciation or both? How much appreciation has there been in recent years? What is your articulable path of progress for the area? Why do you think it’s a good bet? Here are a few concrete strategies for getting started answering the above questions. (2)(a) Google like crazy. You’ll find goodies. Wikipedia articles for the city. Official government websites and reports. Investor presentations written by real estate firms. Data charts and stats tables. Relevant newspaper articles. Key zoning regulations. You should spend a good chunk of time just on Google, aggressively typing query after query, tearing through page after page, document after document. This is the first thing you should do. (2)(b) Get on the phone and call local real estate agents. Since you might work with any or all of them, doesn’t hurt to call a few local agents to get their view. They spend all day criss-crossing town for showings and closings anyway, and they’re constantly networking with sellers, lenders, lawyers, etc, so they’ll have opinions about companies/industries in the area and housing market trends. If you call several different agents and they all echo the same theme or insight, pay attention to that – there’s probably something there. (2)(c) Network at your local REI meetup. If you’re in driving distance, go to the local real estate investors meetup (find it on Meetup.com) to meet other investors, brokers, lenders, even contractors, and get their thoughts on macro trends in a meetup happy hour setting. Any kind of forum gathering where you can access a lot of relevant folks at once and compress your knowledge/insight acquisition into a short amount of time is usually a worthwhile use of time. (2)(d) Read the city’s financial report. Did you know most sizeable cities prepare an official annual audited financial report? It contains a gold mine of relevant info on employers, population/job growth, new construction trends, affordability. Tons of stuff you’d want to know as an investor. Read that report (long and complex, but worth it) for insights. It’s well worth your time, so I even wrote a whole blog post on how to dissect a city’s financial report. (2)(e) Calculate local cap rates. Use my spreadsheet tool to calculate useful stats like cap rates, cash on cash, gross rent multiplier, etc. But also learn to calculate them by hand, how they conceptually work. You’re going to be doing these calculations all the time once you get serious, so know them by heart. The basics: Cap rate = net operating income / purchase price. 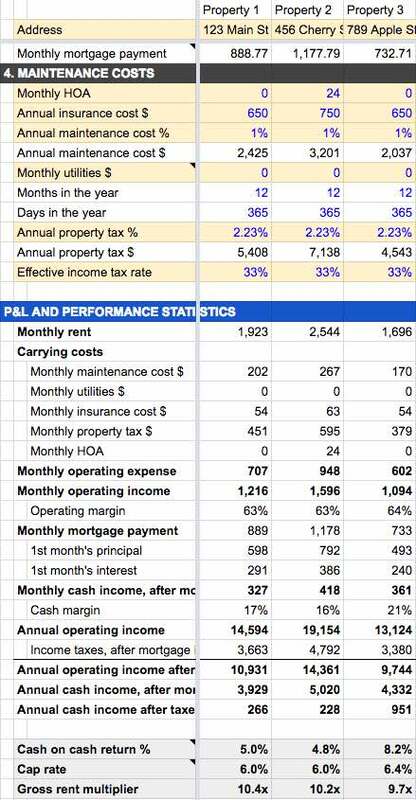 Net operating income = rent – all operating expenses (not mortgage). 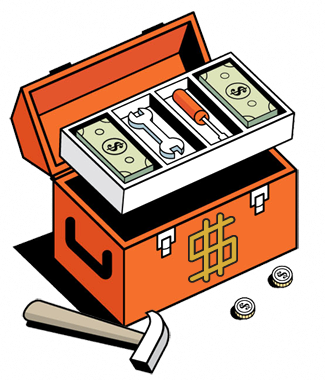 Half of rent is a reasonable mental shortcut for estimating all expenses excluding mortgage. Cap rates >5% are generally pretty high for a competitive market, although you can still get cap rates closer to 10% in some decent (albeit less competitive) middle-of-the-country markets, too. In my area, cap rates are 2.5% – 3%. That means house prices are super expensive relative to rents. 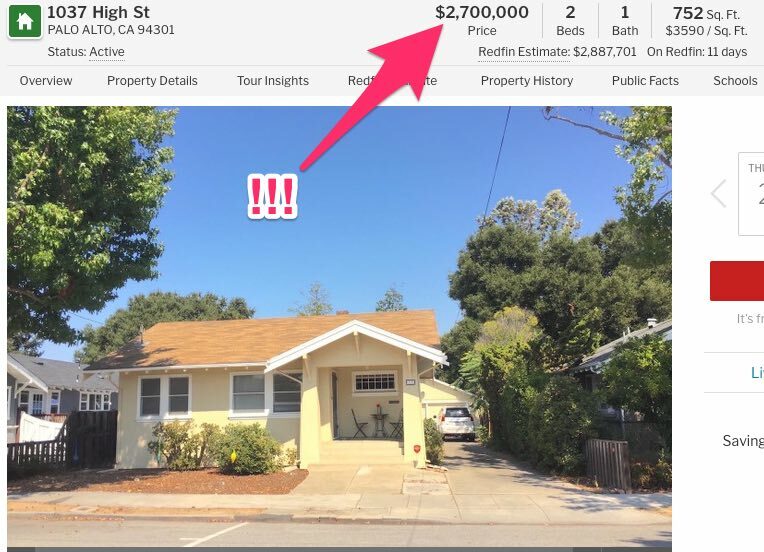 You can easily estimate rents for the area (and also get a feel for vacancy rates) by doing some quick searches on Craigslist, Zillow, Padmapper, and Rentometer. Usually cap rates inversely correlate to home price appreciation, so the higher the cap rate, the less likely homes in the area will appreciate, and vice versa. High cap rates are desirable, up to a limit, and then they become risky. In cities like Detroit, cap rates are through the roof…but would you want to live there? By contrast, cap rates are razor thin in desirable places like Santa Monica, Palo Alto, Midtown Manhattan, Northwest DC. Everyone wants to live there. (2)(f) Look up the area’s major employers. Use tools like Glassdoor.com and Indeed.com to get insight into the major employers: how big they are, average salaries, etc. You can also look up salaries for specific positions in a geographic area, which helps you get a sense of average wages relative to rents for your ideal target renter. Man, this sounds like a lot of work, right? Well, it is. But do you want to build real estate wealth or not? You’re gonna have to hustle for it. Good thing is, once you do this research once for one property, other properties in the same area will be much faster because the same facts, insights, and research apply to them as well. (3) Crunch the property numbers: 5-10 min. OK after researching the area and understanding the “path of progress,” next thing we do is whip out our spreadsheet tool to crunch numbers specific to the property we’re interesting in buying. I used to work in private equity investing and as a Corporate Finance & Strategy consultant at McKinsey, and I’m a CFA, so it was natural for me to self-build my own financial model to analyze real estate. Actually, I built 2 models. One is a quick and dirty model that answers 90% of your questions, and lets you compare properties side by side in each column of the spreadsheet. Takes 5 min to run. Very useful during the prospecting phase. You can quickly see your mortgage numbers, P&L, Net Operating Income, and capitalization stats (cap rate, cash on cash, gross rent multiplier, etc). The second model I built is a big monthly model that models out performance of the property month by month for 20 years. Then it draws charts showing break even points, equity growth, etc. I use this model AFTER a property is acquired to track monthly progress of actual financials vs. projections. Very useful during the “holding period” phase. (4) Contact the listing agent for an inside scoop: 1 hour + a few follow ups. After I’ve developed my own views on the location, immediate surroundings, the path of progress, the economics of the property, it’s time to get off the computer. I recommend at this point reaching out directly to the listing agent. Time to get some qualitative intel on the property. You’re looking to understand seller goals, current interest in the property, and any big material items that could be deal-breakers. For seller goals, I ask the listing agent why the seller is selling now, what their top goal is (price, flexiblity, minimizing taxes, sentimental, etc), and any special circumstances they have coming into the sale. Of course, the agent can (and often will) “spin” these answers favorably, but there’s still useful insights to glean as long as you filter/scrutinize appropriately. By the way, I should also say the listing agent doesn’t have to talk to you at all. They may require you to go through your own agent to talk to them. Different listing agents operate under different norms. Even if they do talk to you, they may not share info you ask for. But no harm in asking! And if they do share info with you, beware they have strong incentive to position the facts in the most favorable light, because they want to sell at a high price to make a big commission. So use judgment and filter what they say. Probe and follow up if you’re not getting straight answers and cut it short if you’re getting low return on your time. But don’t shy away from asking, because you can get great (free) insights just by talking with listing agents. Also, not all listing agents are like that. Good, skilled, highly sought after ones don’t waste time playing “hard to get” and tend to “spin” facts less, because they actually have other real skills: they’re good at building trust, bringing creative deal structures to the table, and having a big network of buyers eager to buy their deals. They don’t need to position or spin. They care more about protecting their reputations. OK. Besides seller goals, you want to gauge current interest in the property. Now, if the property just came onto the market an hour ago, it’s probably not going to have meaningful buyer interest yet. Sure, if it’s a terrific property in a hot market, the listing agent’s phone will start ringing non-stop within 5 min of posting the listing. But calling them to gauge interest 1 hour later won’t get you a very deep answer: they’ll say, “yeah, there’s a lot of interest” or “my phone is ringing off the hook” but, frankly, that doesn’t tell you much. So go ahead and ask how much interest there is, but also ask whether disclosures are available and, if so, how many disclosure packets have been sent out so far (an indicator of serious buyers). If it’s only been an hour then probably no disclosure packets have been issued; disclosures may not even be available yet. Make sure you get a packet when they become available. And be sure to follow up with the listing agent periodically to re-ask how many disclosure packets are out: that’ll give you insight not only on how many buyers might be interested in writing offers, but also the velocity buyers are developing that interest. Finally, once the property has been on the market 1-2 days, I start asking the listing agent whether they’ve received any offers yet. As you can tell, my general strategy is to periodically follow up with the listing agent, not just call them once at the beginning. Information changes quickly, so it’s helpful to understand not just how things look as a “snapshot” at the beginning, but also how buyer and seller interest is trending over time. Because you can get lots of informational nuggets from the listing agent (who, you should always remember, represents the seller, not you), it’s important to build a strong relationship with them from the get go. Be polite, friendly, and build rapport. Don’t be pushy or annoying. Pick your battles in terms of info you push for, and know when to let things go (e.g., if they’re being cagey or unresponsive). In addition to seller goals and current interest, you can often save yourself time by asking the listing agent straight up about known conditions or defects with the property. If they tell you about something that’s a deal-breaker for you, you can end the process right there. They might still be inclined to spin facts favorably, but be aware there is also a legal standard they must adhere to for disclosing information. They generally HAVE to disclose material facts known to them about the property that would affect marketability of title. To be clear, they don’t have to give you a comprehensive laundry list of known defects in the property which you could discover yourself, but they do have to disclose material items. And they cannot omit or hide any information known to them about latent defects that would be hard to discover with reasonable due diligence. If there are tenants, it’s also a good idea to ask what the tenant situation is. Are they on leases, or are they month to month? Is it likely they’ll want to stay after the property is sold? You have to understand whether you’re going to be acquiring the property tenant-free or inheriting tenants. Obviously buying tenant-free is simpler and less hassle, but most sellers would rather not deal with emptying the units before selling, especially if it’s a hot seller’s market. Finally, ask when the property will be available for showing or open house. Even if the listing agent gives you a ton of info by phone, you’re still going to want to see it in person (if you’re local). Whatever info the agent gives you helps you develop a checklist of things to watch out for when you actually go view the property. Now, what if you have your own buyer’s agent? Should you shuttle all your questions for the listing agent through them? I recommend no. You don’t want any delays in your communication velocity by lagging through an intermediary. You also don’t want to have to interpret the listing agent’s comments “filtered” through your buyer’s agent’s ear. Your incentives are overlapping but not identical to your buyer’s agent’s. It’ll be hard enough to interpret the listing agent’s positioning/spin; don’t compound that by adding another agent’s potential positioning/spin. In the next post of this series, I’m going to cover a cool strategy for making your property visits MUCH more efficient. I’ll show you how to methodically inspect a property step by step, what exactly to look for, and how to judge whether something is a deal-breaker or not. I’ll also show you how to think about repositioning a property to add value and make it a magnet for desirable tenants and high rents. Finally, I’ll share a tip/strategy that has saved my a** over and over again. Now I do it on every property I visit. Check out the next post here (forthcoming). Discussion: What’s YOUR checklist for due diligencing a property? How is it similar/different from mine? Any important lessons you learned from the school of hard knocks? Share a comment below!